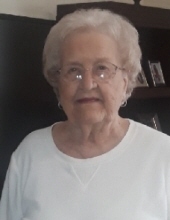 Anita Webb McCoy age 82 of Pikeville, Kentucky passed away Sunday, November 25, 2018 at the Cedar Creek Assisted Living Facility. She was a retired Secretary and attended Bowling Green Business College. She was a member of the Pikeville United Methodist Church. Anita was born November 8, 1936 in Pikeville, Kentucky the daughter of the late Albert Turner and Katherine McGuire Webb. Along with her parents she was preceded by one son, William Albert McCoy. She is survived by one daughter, Kimberly Renee Glenn (Dan) of Boonton, New Jersey. She is also survived by two grandchildren, Elizabeth (Chad) Damron and Jason Paul (Katina) McCoy LCDR US Navy and three great-grandchildren, Dailey Damron, Keyton McCoy and Conner McCoy. To send flowers or a remembrance gift to the family of Anita Webb McCoy, please visit our Tribute Store. With Paston Willard Knipp officiating. "Email Address" would like to share the life celebration of Anita Webb McCoy. Click on the "link" to go to share a favorite memory or leave a condolence message for the family.